NumaStore allows user to migrate from obsolete, unreliable and slow backup band aids to a modern, scalable and supported image management solution. NumaStore provides a cost effective, robust, reliable, and user-friendly image management system designed specifically for nuclear medicine and PET/CT studies. NumaStore offers secure long-term storage and efficient retrieval in a way that facilitates and encourages comparative analysis during a patient visit. These abilities encourage a change in the way nuclear medicine is used, from simply a diagnostic snapshot to a long-term care patient management tool. 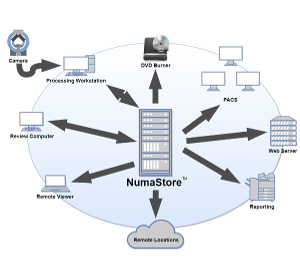 NumaStore is expandable, reliable, and secure, while maintaining the integrity of the original raw and processed data. Enables user to sort and query images and create custom attributes for research and teaching. Communicates via DICOM, C-Store and Query Retrieve functions, as well as manufacturers’ native formats. Complete turn-key hardware and software solutions available.